Welcome! We’re halfway to waves. Learning to surf can be a transformative experience. If you’re planning for a Las Olas surf safari, or just thinking about it, chances are you’re ready for change. So why not put your mental and physical needs first with Las Olas’ 30 Days to Waves challenge? Think of our challenges as tasty, bite-sized appetizers to get you in the mindset and kickstart your body for the journey ahead. 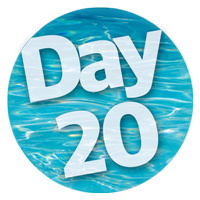 The 30 Days to Waves challenge focuses on three areas of your well-being. Community is important for knowledge and encouragement. 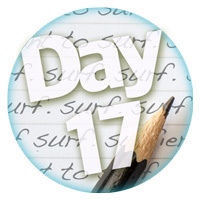 Reach out to a friend who surfs and ask them about their experience. How did they get started? What do they love about surfing? What is their advice? Write what you learned in a journal entry. Let’s start this week off strong. Warm up with two dozen jumping jacks. Then visit Athleta for Las Olas surf coach Amanda’s planks with arm raises. Try 10 on each side. Follow up with 10 yoga push-ups. Finish by stretching your hamstrings, quads, and arms. For all living things, water is refreshing, cleansing, and essential. 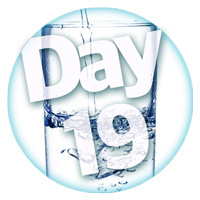 Make a point to drink an extra glass of water this morning and another right before you go to bed. Now make it a habit! Let’s go for a swim. Don’t have access to a pool? Substitute a 30 minute walk or bike ride. The key is to get your blood flowing. Afterward, stretch out by doing two vinyasa flow sun salutations. For a complete vinyasa yoga class with Sangeeta Vallaghan, visit Yoga Journal. This Thursday is sugar-free! (We just made that up.) Need a mid-afternoon pick-me-up? Skip the mocha and go for a 15 minute walk instead. Breathe in through your nose, out through your mouth. It’s better than sugar to get your energy back and has zero calories. Watch some more surfing clips at Vimeo, then practice walking the board at home on the carpet. Julie shows how to master the cross step here. Now close your eyes, focus on your breathing, and dream of gliding on smooth, shiny waves. Enjoy doing something outside today! Hike near a body of water ― beach, lake, river ― or better yet, SUP, kayak, or paddle in it! Don’t know any large bodies of water nearby? Start your search here. Excellent. One week to go! 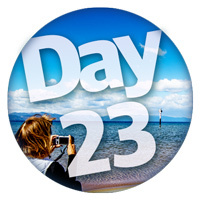 Explore Week One and Two 30 Days to Waves challenges.